Today at Breakaway we fit in just about as much as we could possibly fit into one full and fun and incredible day. We had two incredible sessions with our worship team and our speaker Rick Pilieci. We also had two huge group games, time at the tubing hill, and lots of time just hanging out. This afternoon, we ran three optional tournaments including dodgeball, European handball and flag football. We also ate breakfast lunch and dinner and enjoyed an ice cream bar and finished our night off with night tubing and our annual talent show. And though I’m incredibly tired, I’m also incredibly thankful for a pretty amazing day. 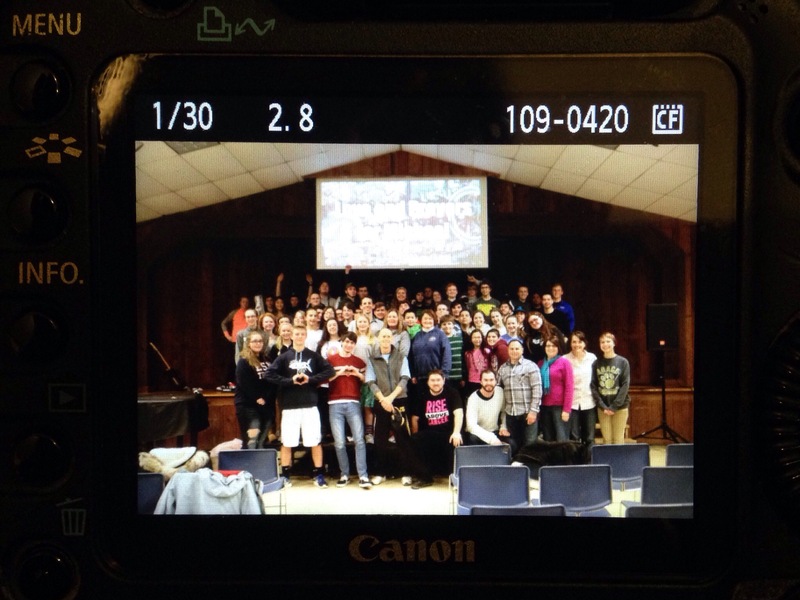 Our leaders and students are bonding and being amazing and it’s been the absolute best weekend. And I’m writing this again hunched over in my little bunk bed in our little cabin in the woods only instead of midnight, it’s now just 1:00am. But I’m writing because I want to share about something that I know Michael loved. As I’ve mentioned before, he came to five years of our Breakaway Retreats. He sat in the sessions, and rode numerous tubes down the tubing hill. He played in all the tournaments and in all the group games as well. He made the most of each retreat and I’ll be honest… There have been so many times that he’s been so heavy on my heart this weekend. We would have loved nothing more than to have him join us. This weekend, our speaker Rick Pilieci has been talking about the theme “Follow.” We are all following something in life… Some of us many things. But most important and something that Michael learned years ago was the importance of following Jesus. In John 8:12 Jesus said “I am the light of the world. Whoever follows me will never walk in darkness, but will have the light of life.” Michael followed Jesus and because of that he has been a light to so many. His story has offered hope and has encouraged so many to become faithful in praying to God and in growing in their faith. We’ve been affected this year at Breakaway. 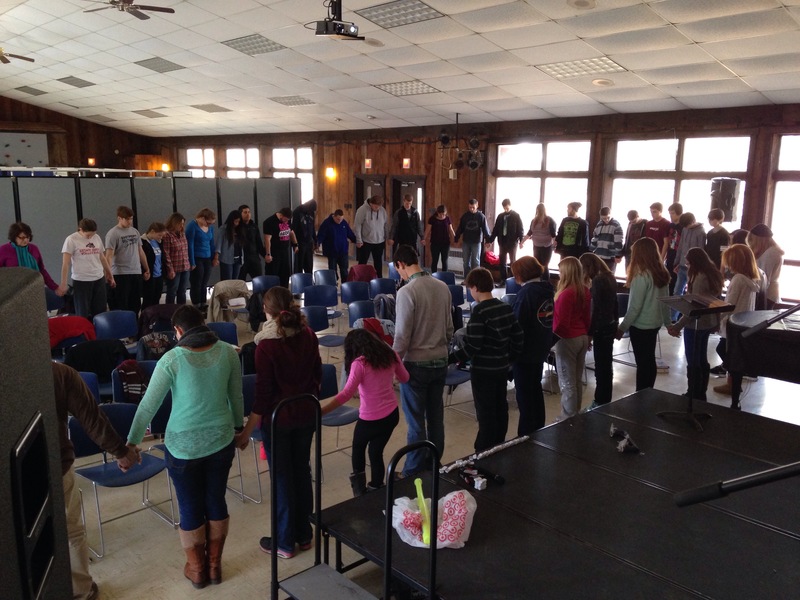 This morning we gathered for a special prayer time for Michael. It was beautiful and such a good way to honor and support our friend. And then this afternoon we all stood together to send our love and our prayers to Michael. Sorry about the quality of the picture… I took a picture of a picture. Sally texted me tonight that Michael is doing about the same as yesterday. He has had a few more tests and the doctors are figuring out what will come next in terms of future things that Michael may need. So tonight I’m asking that we could pray that God will give Michael exactly what is best and what he needs. Prayers for Gods power in healing Michael’s brain would be greatly appreciated as well. Thanks so much for stopping by! Laura, I an so relate to your comments about the seniors. It is hard to see them go and with it the leadership and character, much as you have said of Michael. We continue to pray for him and his family. Your updates in your updates in your blog are very informative and from the heart. The best type.